Hiring or leasing a vehicle is based on an agreement that ensures that the vehicle will be returned in intact condition. Well, if you hire a car, or lease it out to other parties, you must sign a vehicle appraisal form. 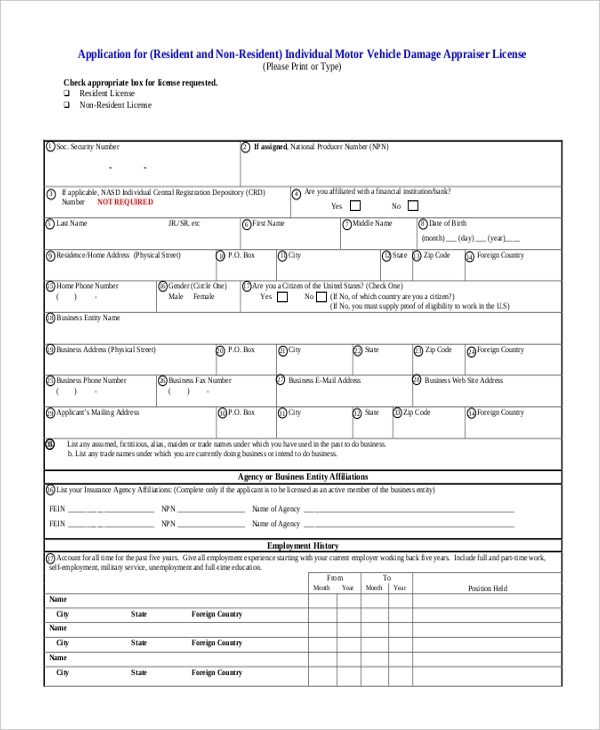 The condition of the vehicle is recorded in this form before it is hired. If the vehicle is damaged in the process, the concerned person has to compensate for it. Check out the Appraisal Form samples to know more about the documents. The dealer information and the vehicle information are included in separate sections in this template. The document is signed upon by both the parties in the end. 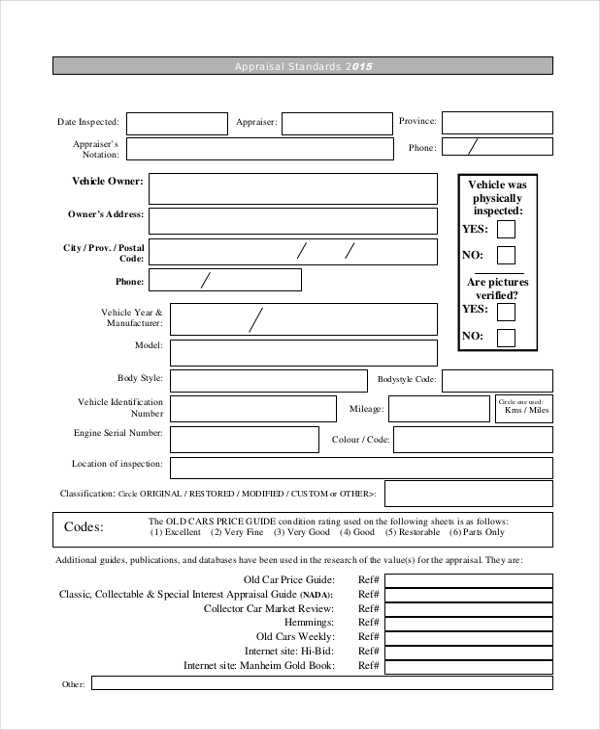 This form contains the information about used vehicles that are hired out. The specifications of the hirer’s and vehicle information are presented at the top. It is followed by a tabular representation of the condition of different parts of the vehicle. You may also see Sample Sales Appraisal Forms. These are used by agencies that hire out vehicles to other parties. Different parts of the vehicle are listed up on both sides of the form and they are assessed before leasing it out. You can also see Sample Teacher Appraisal Forms. 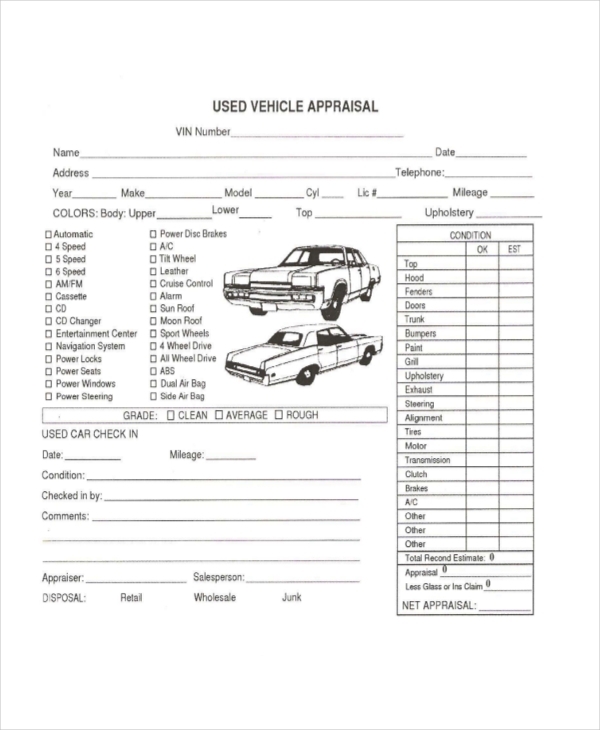 These forms are used to list the damaged areas after a vehicle is returned. The form contains information about all the parts of a vehicle, and if any of these are damaged, the owner can demand a compensation. These forms are used by commercial car rental companies. 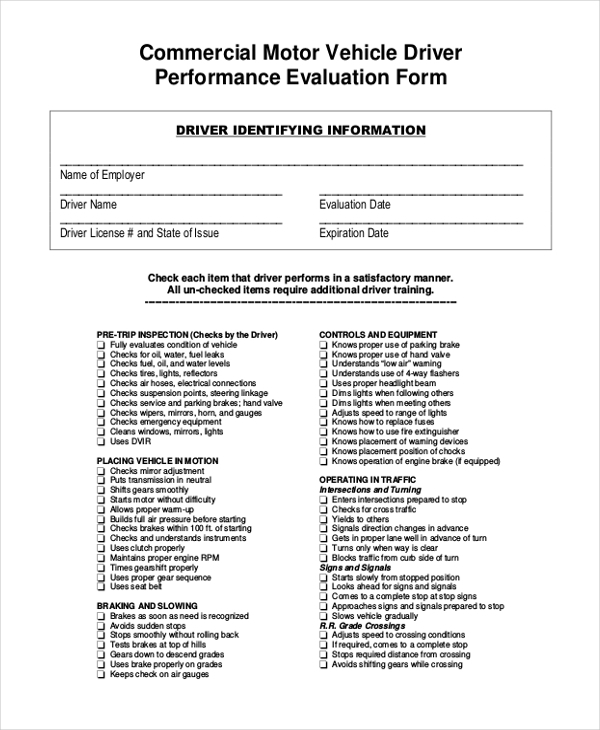 The driving habits of the driver can be assessed from this form. Braking, turning, parking and other aspects are specified here. You may also see Sample Real Estate Appraisal Forms. This is a tabular format, where the vehicles are assessed for the condition of different parts. These are used by car rental companies, private individuals who hire drivers and corporate companies. These forms are used to assess the conditions of a vehicle before and after leasing it out. Private owners use the form to ensure that the drivers are taking necessary care of the vehicle. If there are damages to the vehicle or certain parts of it, the owner must make the driver aware of the damage and ask for compensation, if necessary. The same principle holds good in case of commercial vehicles. Vehicle rental companies have several vehicles, and they use these forms to keep a track on the health of the vehicles. 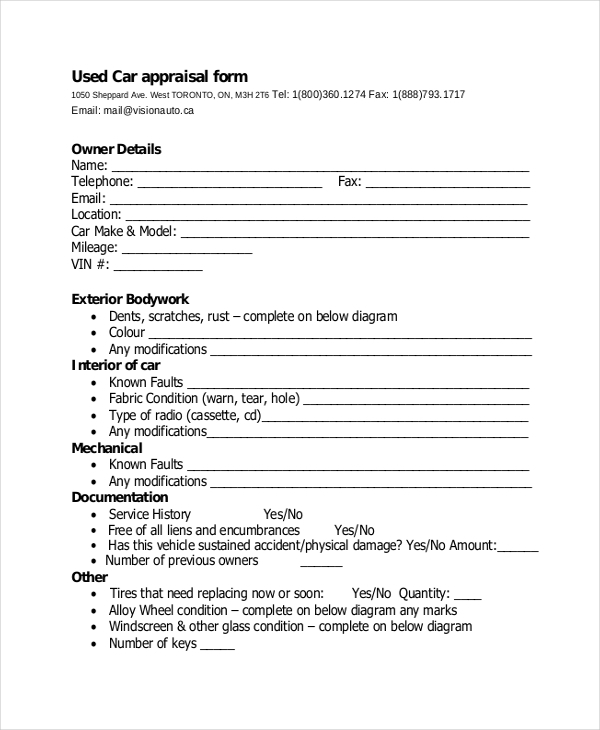 Check out the Vehicle Appraisal Form example to view the elements in it. You may also see Sample Self Appraisal Forms. 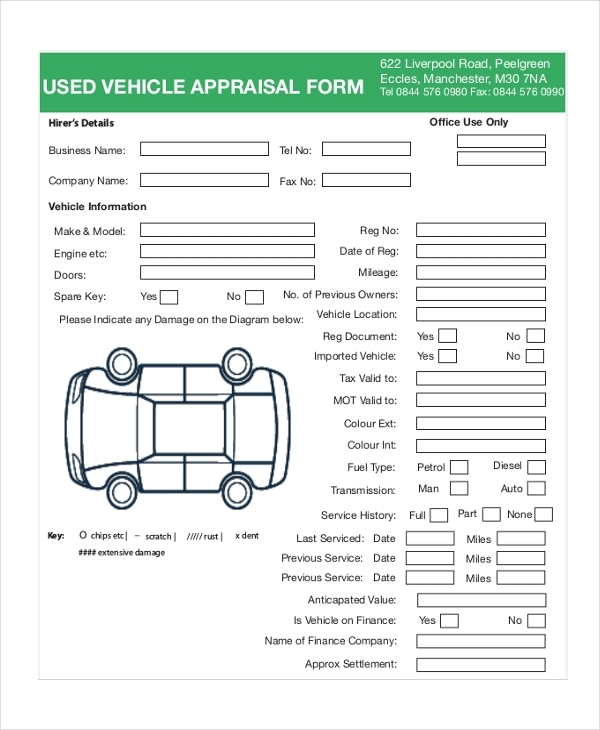 A vehicle appraisal form can be used by any person handling the vehicle. From a neutral perspective, it is necessary for both the parties to sign the agreement to avoid hassles in future. Corporate companies often hire vehicles from vendors for private use or to provide pick and drop facilities to its employees. Apart from these, travel agencies often lease out vehicles to tourists. Individuals too, hire vehicles for various purposes. Certain people appoint drivers for their vehicles. This form is used by all these people to ensure that the vehicle remains in good condition. You can also see Sample Staff Appraisal Forms. When you hire a new vehicle, make sure that you sign the form. If you are a driver, you should sign the agreement with the owner of the vehicle before you take it over for driving. You may also need Vehicle Bill of Sales Form. Browse through the website to get relevant forms and download them.